In the recent draw held on February 27, Saskatchewan has issued ITAs to 83 candidates through the Express Entry sub-category. The candidates are invited to apply for a provincial nomination for Canadian permanent residence. The lowest-ranked candidate invited had a score of 68. 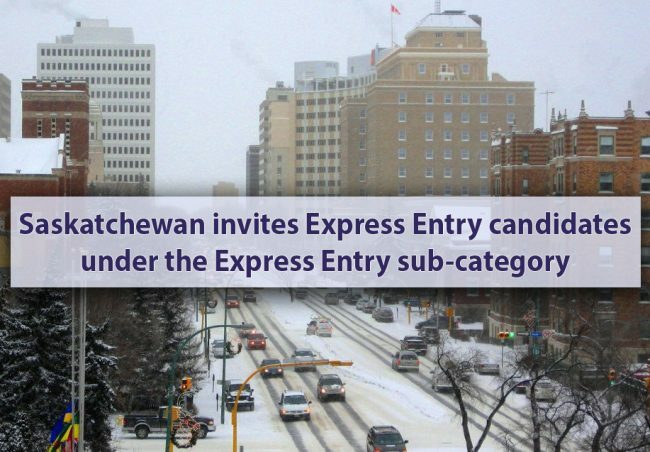 Those invited had an Expression of Interest, or EOI, registered under Saskatchewan’s International Skilled Worker Express Entry sub-category, which allows the province to nominate candidates in the federal Express Entry system for Canadian permanent residence. The Express Entry system manages the profiles of candidates for three of Canada’s main economic immigration categories — the Federal Skilled Worker Class, Federal Skilled Trades Class and Canadian Experience Class. By successfully receiving a provincial nomination, an additional 600 points are grantedto9 the Express Entry candidates towards the Comprehensive Ranking Score. This allows their applications to be fast-tracked for an invitation to apply for Canadian permanent residence. Potential Express Entry candidates must register a separate EOI with the Saskatchewan Immigrant Nominee Program (SINP) in order to be considered for a provincial nomination from Saskatchewan. An EOI profile requires information on education, work experience, proficiency in English or French. You can also claim points if you have any connections to the province, such as a close family member or past work or study experience in Saskatchewan. It is required that besides other criteria, the Express Entry candidates must have work experience in one of the high-skilled occupation found on Saskatchewan’s In-Demand Occupations List. Profiles with 60 points or more are eligible to enter the pool of candidates. A set number of the highest-ranked are then issued invitations through regular draws. We at Immigration Experts are here to guide you in this regard. If you are interested in processing your immigration for Canada, Australia or New Zealand, you may contact us by phone or email. By subscribing our Youtube Channel, you get access to all the updates regarding immigration and visas.